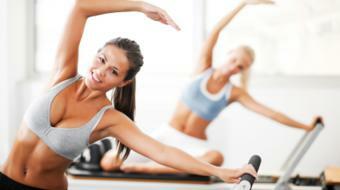 Danielle Langford, BScPT, MPT, MCPA, Physiotherapist, discusses how Pilates can help back pain. How Pilates Can Help With Back Pain - Treloar Physiotherapy Vancouver BC Danielle Langford, BScPT, MPT, MCPA, Physiotherapist, discusses how Pilates can help back pain. Pilates is working from your core, creating a foundation so that you can move throughout your day better and easier. Clients often experience the vicious pain cycle between exercise and pain, exercise and pain. People are told especially with back pain that they have weak cores and they need to go strengthen their core. So then they go and find a class, a community class or whatever, to work on yoga, working on their core, a Pilates class. Even going to a personal trainer. Or they try to return to the gym. With that, they often get frustrated because sometimes they’ll experience more pain with that, and then the cycle continues again. So basically those community classes can be a little bit challenging in the sense that there’s some competition involved, there is pleasing your instructor, there’s different elements to it. And, and sometimes your lack of body awareness can, can play into that vicious cycle. With clinical Pilates, it’s one on one. So you, your body’s gonna be different than someone else’s body. So from that we can break down and give you specific exercises, specific cues that can actually have you feel that. Versus it’s a little bit challenging sometimes in a group scenario for an instructor to target everybody’s individual cues and individual imbalances. So clinical Pilates is good in that sense that it, it helps tie that in for you so that you can feel it for yourself. Then you can go and take that to the class, and then you can feel more confident in your class and have more success with it. Pilates uses numerous machines. There’s reformers, there’s chairs, there’s trap tables, there’s small apparatuses, balls and so forth. And the nice part of being, about Pilates is the machines that you can use with that as well. Because it helps to support you. So very often people have a hard time firing their core, but when they’re on one of the machines, they can experience that because of the way the machine moves and the way it supports you so that you can actually access those muscles a little bit easier. If you’re caught in that vicious cycle of back pain and exercise, contact your local doctor. They can refer you to a physiotherapist or your local clinical Pilates instructor to stop that cycle.